ProTaper Pillow Top MX grips have achieved a legendary status among dirt bike grips for a reason. It all comes down to the Vibrasonix pillow top on each grip combined with a gel-like surface compound. This combination reduces the vibration which is inherently transferred from the handle into the grips. The result is a softer feel, where the grips act as a cushion on each hand. ProTaper has really figured out how to create comfortable dirt bike grips with the Pillow Tops, but that's not the only thing to get excited about. The surface compound is tacky and will keep your hand from sliding around on the grip, but the inner compound is also important, keeping the grip firmly in place on the handlebar. The Anti-Rip Tip is a separate compound from the rest of the grip and is designed for off-road rigors and built for longevity. Aside from vibration reduction, another great thing about the Pillow Top hand grips is that they have a self-cleaning pattern. This means that when you're getting mud as high as your handlebar, you don't have to worry about your grips as they're designed to shed mud. This is a great feature for trail riding, but it's especially great for MX when you don't have time to stop and clean your hand grips. The Pillow Top is also a little larger than standard grips. If you have oversized hands, you might find the ProTaper Pillow Top MX grips to be even more comfortable. When it comes to MX hand grips, ProTaper has a real winner. If you think you're ready to handle an extra level of comfort on either the MX track or the trail, pick up a set of the ProTaper Pillow Top grips. The ProTaper Pillow Top tri-density grip features an acoustically dampened palm area with an ultra-tacky compound that virtually eliminates vibration. The perfectly designed Anti-Rip Tip ensures long grip life. The ultra-bonding black inner core grabs the handlebar like a vise. Grips are for use with twist throttles. If you put these on properly, they won't budge until you take them off. Clean off your bars and throttle tube and spray a little starting fluid inside the grips. Slide on and your done. No wire needed. These are just the best feeling grips ever and last a long time. Most comfortable grips I’ve found. Work great for vibrations as well. Only complaint is I have never had a pair long enough to wear them out. Grip ends tend to rip off after a couple tip overs. They are cheap so replacement doesn’t hurt the bank account. These are great grips. I have both the regular & slim. Since I crash a lot durability is most important. Seems I always fall on the throttle side. Have held up well. Very reasonable price. Very comfortable grips. Order the color that you want and it brightens your bike up a little. look good and easy on the hands. Great grips at a great price! They are soft but don't tear easily and have great tack. They dont last long but are well worth it, consider buying multiple pairs at a time, especially if you ride on the regular. These are my personal go to grip i put them on everything i own. They dont last a long time but they are very comfortable and help tame the 2 stroke vibration. They wear out pretty fast. It's my number one grip. Works in all conditions. I like the stuff inside wall. I was a half waffle guy for years. My favorite grip, comfortable. And are long lasting. These are the best grips that I have had, but you need to cut off the end of them for a handguards. If you cut off just the end it looks rednecked so I cut off all of the colored end. This is my second set, I love how comfortable the grips are and they stay pretty grippy even when wet or muddy. Also, a pretty good price. hands down best grips even if they arent the most durable. only grips i use. i have tried many over the years but always come back to these. be cautious putting them on as they are soft but well worth it. These went on better than grips I have used in the past definitely seem way more durable than the ones I have bought in the past cant wait to hit the track! Very comfy grips. Definitely an improvement over the stock ones. These are the best grips! I use these on all three of my trail bikes. They last long, very comfortable and you just cant beat the price. The best bang for your buck. These are the only grips i run on all my bikes!!! Lots of grip! they last forever and have a decent cushion to them!! They fit perfect, are very comfortable and provide great grip. I highly recommend them. These grips are great. I always put these on every dirt bike we have. I have been using these for years and they really work well. They help isolate some the vibration from your hands and cushion some of the blow from the suspension. I put a significant amount of pressure on the outside of my palm. Nice soft rubber. Might be a little large for smaller hands. I get good durability out of them, typically 16 to 18 races. I like them. They're comfy and grippy. I hate that I have cut the pretty red end off to put my crash guards on. Quality grips that last and if you have big hands you may like the extra cushion. Very great bang for your buck but not quite as sturdy as stock grips. 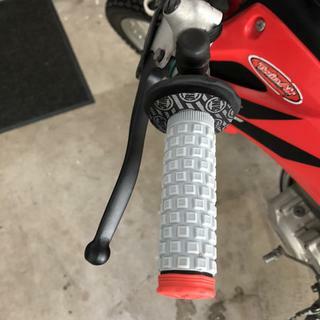 I have a Honda crf 230 and these are more comfortable than the stock grips but the sides are a little weak if scraped on a wall or something to that effect when moving the bike. Grips are a very personal part of your bike and a important because it's one of the few contact points to it. Hang on my friends! What size of handlebar do these grips fit? BEST ANSWER: They fit both 7/8 and 1 1/8. The fat bar is only at the mount and tapers to 7/8 at the grip. I would definitely make sure that if you have a twist throttle that you get the mc version and vice versa for atv as the MC version is bigger on the throttle side to fit the twist tube. They should fit any motorcycle handlebar that is 7/8" diameter at the bar ends which really is just about any common handlebar. Even the Answer Protaper bars and all the 1 1/8" bars that followed it "taper" down to 7/8" at the grip area so chances are high they will work for you. Personal water craft and snowmobiles may be different so measure your bars there to make sure they are 7/8" in diameter. Good luck. These will fit any standard handlebar. I have used them on my 450, 250, and 65. Renthal and Pro Taper. Very good grips, comfortable, and good looking on the bike. Depends on the bars fits on both sizes, in my opinion they are the best , feel good and less vibration. and easy to install. Jus to the typical motorcycle handlebar, all 7/8 and 1* 1/8 bars are all the same on the ends. Universal fit for handlebars, but specific to those vehicles with a twist throttle. Fit is universal...Fit my 1 1/8 Fly Racing bars no problem. 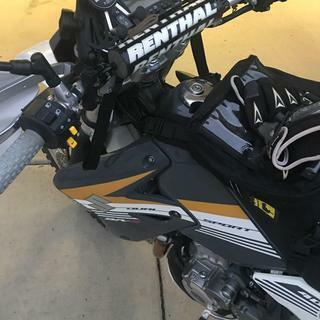 Any standard mx bar and throttle tube. I have used them on 7/8" bars. Will these fit a 2003 Yamaha TTR125? BEST ANSWER: Yes they'll fit, these are great grips in my opinion. I have them on 2 different bikes and I'll be ordering some for replacements. Yes they will. 99.9% of all dirt bike handle bars fit a standard hand grip. However, don’t get an ATV grip. Yes should fix perfectly and they feel great. I have a 2018 Husqvarna FE 501. I asked my dealer to install Pro Taper pillow top grips. They tell me it's not possible unless I want to purchase a new throttle tube because most all new bike are "lockon" Never heard of this before....what are they talking about? BEST ANSWER: The dealer is correct your Husqvarna comes stock with ODI lock on grips which mean that the clutch side is a simple bolt to tighten the grip down and on the throttle side the grip comes attached to the throttle tube. This is installed the same way you would a throttle tube which means that you cannot remove the grip from the throttle tube leaving you with the options of either replacing with a different set of lock ons or buying a standard style throttle tube and then installing the pillow tops like you normally would. Many OEM throttle tubes are not meant to be reused. I don’t know about huskys but i didn’t reuse the oem throttle tube on any of my yamahas or suzukis. The grip and tube are one piece and it bolts on so if you want to put pillow top grips you have to get a standard throttle tube. Im having a terrible time with these splitting when i install them. Ive tried crushing them before sliding them on to minimize any air pockets as well as putting a hole in the ends for air to escape. Any other tips or tricks? Ive had 3 sets split on me now using these methods. Thanks for the idea. I forgot to mention ive been using clear coat spray paint. It lets them slide on easy and tries within a hour. I've had 4-5 sets of these and have never had an issue like what you describe. Are these all recent? Could you have gotten multiple units from a bad batch. Conversely, have these all been on the same side (throttle side)? Coud you be trying to put the left side grip (which is smaller) over the larger diameter throttle tube? These grips have never split for me. I always clean the bar, add the ProTaper glue, and then slide them on. As I slide the grips on, most of the air will burp out. Any excess air trapped in the grip comes out a small hole I put in the end of the grip right before I put my Cycra hand guards on. Havent thought about starting fluid. Ive been using clear coat spray paint. I blow air into the open end with compressor while putting them on. They stretch like a balloon slightly. You gotta work at it, but it does work. Thanks for the idea. Ive actually been using clear coat spray paint, just forgot to mention. Helps them slide and typically is ridable within a hour. Can I have bark busters installed with these grips? They go connect at the bar end. BEST ANSWER: Of course you can, very simple with a new blade in a utility knife. Just carefully cut a circular hole in the end of each grip(a little larger on the throttle side) and use grip glue, mount your grips, install your bark busters and check for throttle return, let your glue dry. Go ride! Yes. 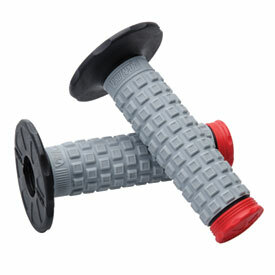 I have these grips installed on Twisted Enginering flexible handle bars with bark busters. All you have to do is cutout the ends of the grips with a sharp blade so the bark buster bolts will go into ends of the handle bars. Yes you can, but you will have to cut the last 1/4" or so of the end of the grip off. I have run these grips with barkbusters for years. Just carefully cut the end cap off with a sharp razor and you got it. That’s what I did I have Zetas installed with them. Yes, you just have to cut the end out of the grips, no big deal at all. Yes, trim off the end with a razor blade. Will these grips fit a 2012 klx 140L ? BEST ANSWER: Yes, grips are pretty much universal with the exception that motorcycle and atv grips will not interchange. Motorcycle grips have one grip oversized to allow for the throttle tube. They should fit any dirt bike type twist throttle set up..
yes, these should fit yout bike. Do the pillow top grips come with a sticker? BEST ANSWER: I don't ever recall there being any stickers in the package, but they are awesome grips! No, but if you order then from here you will receive a sticker pack. will it fit a hondA 230 F? BEST ANSWER: They should fit any dirt bike with a twist throttle. Don't buy these for ATVs or bicycles or one will be too big. If you run hand guards, you will need to cut off the ends. I usually cut mine where the colored end meets the black ring. Sure will. I have them on my wifes 07 CRF230F as well as a slew of other bikes. They will fit a ton of various models. My 09 YZ, had pro taper bars. Yes they fit great on my 05 230f. Do they fit in a ttr 90? BEST ANSWER: As long as you don't order them from the ATV section they will fit. Big grip hole on throttle side, small hole on the other. I have had 2 pairs of these, good grips. will these fit any bike in the 250 class? BEST ANSWER: Yep, they reduce vibration and have a good grip. I ride a 2012 300 2-stroke which has a fair amount of vibration and these grips are a big plus. can i use it on my 2018 husquvarna fe 300 ?? BEST ANSWER: Grips are pretty universal so I'm not sure why not. Using them on a 2015 FE 350 currently. What is the length of the MC grips, in other words, how long are they? BEST ANSWER: 4 1/2"in. Personally I have never encountered a vehicle with handle bars that did not use this length. besides snowmobiles. same as any standard grip? are they different lengths?